Today I have a commercial advertising the attractions of the city of Southlake, TX that I believe was made for the city’s marketing website. Do you know what I took away from this video? That this city is weird and that they didn’t have enough footage. I swear that same shot of the little kid marveling at the fountain was in there multiple times. And it’s not even that great a shot (he’s cute, but what does it tell me about Southlake, really?). I do have to admit, there’s a part of me that really wants to know why there are dachshund races being held. I mean, if you’ve ever met a real, live dachshund you know that their legs are very short (like, less than six inches high for a dog that’s typically about a foot and a half long not counting the tail). That’s not really a dog built for racing. They’re cute, but not speedsters. And why do they each need their own fenced in lane? Where there fights breaking out between the racers? That doesn’t really seem dachshund like either. Most of the ones I know will stand back and bark at you forever if they feel threatened, but if you get to close, they just back away and keep barking – actual contact is pretty much avoided. Besides the strange dog races, I’m not quite sure what’s in Southlake that’s worth going there for. There are apparently hotels, which I guess is good, since I’d need some place to sleep, but they didn’t show any especially remarkable hotels. Beyond that, they showed a lot of retail stores that are basically everywhere else too. I mean, yeah, that was a nice looking Barnes and Noble, but there’s one of those in pretty much every decent sized town or city at this point and they’re all pretty much the same. That’s how chains work. Yeah, the employees can make a big difference in how a particular store is stocked or set up, but fundamentally the same displays appear in every store and the same large quantities of boring bestsellers appear in every store. So how is that a tourist draw? Basically, I’m not sure how this video was really supposed to entice me to visit this place. Maybe find out when those races take place and stop by if I’m already in the area, but that’s about it. If they have better enticements for tourists, they need to show them, because chain stores, boring hotels and unspecified events isn’t really that exciting. New Mexico: Where’s the Video? This is a travel commercial for New Mexico focusing on the construction of “Spaceport America”, the first commercial spaceport. I really have to wonder about this commercial. It’s an official commercial, but it really doesn’t feel that way. It feels… well… frankly, fake. Where’s the video footage? This is a video commercial, guys! You can give us more than just still photographs of the space port being built! Still photographs are kind of boring in this context and when paired with the extremely excited announcer, seem really odd. His enthusiasm would feel far less silly if there was moving footage of an actual spaceport being built going on behind him (this would also make his hard hat seem less pointless). The thing is, a spaceport that you can actually visit and tour is a pretty cool tourist attraction. Since such things have typically been exclusively the property of governments and mostly housing secure or sensitive projects, they aren’t usually places you can really tour in any meaningful way. So a commercial spaceport that is not so tightly locked down at every turn and where consumers can actually see what’s going on in more areas is a pretty cool thing. Space and space travel are things we still find fascinating, so it’s absolutely worth using as a tourist draw if you can. This commercial is just so very weak. It wouldn’t take that much effort to make a more dynamic and interesting video that could actually get people excited. I guess I just can’t understand why a video that’s actually boring and kind of makes the announcer look ridiculous was even released when they could have spent just a little more time and made a much better one that either didn’t have those problems or minimized them considerably. This isn’t a video that’s going to help with tourism much, but a good commercial about how exciting it is that there’s a spaceport that you can visit and eventually even use yourself definitely might! World’s Fairs used to be a big deal. They were the place to go to see the latest and greatest inventions, discoveries, art, music and more. They were huge undertakings that drew enormous crowds. Even though they generally existed in their own mini-villages of fantastic buildings, they tended to be hosted by major cities who used the worlds fairs to draw tourism to the rest of their attractions as well. 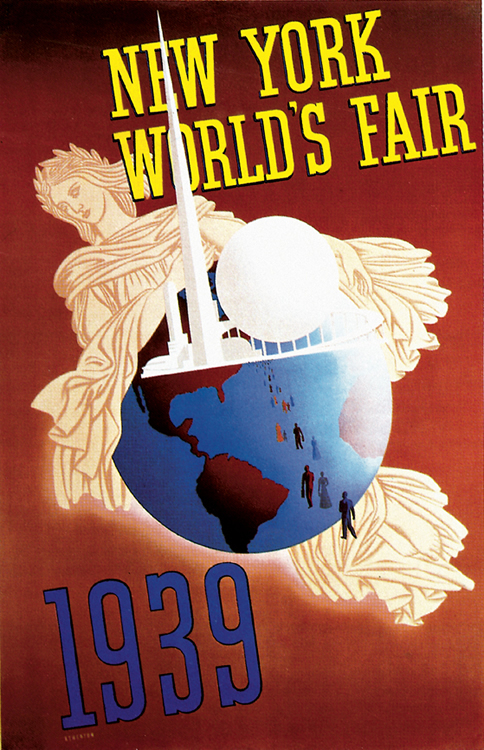 Today I have two posters advertising two different world’s fairs only a few years apart. What struck me most about these posters was how very different they are. Each represents something about the flavor and attitude of the host city. The Chicago poster is bright and busy and the first thing I thought of when I looked at it was music – the visual cues suggest music in a variety of ways (lines on sheet music, radio microphones, etc.). Music is such a cornerstone of the Chicago cultural identity that this makes sense. The poster even has “hear” listed as something you can do when you visit the fair. The New York poster is simpler, but evokes the iconic Lady Liberty, who is one of New York City’s most famous attractions. It also gives the impression that New York is a city of the world, with the globe and people moving across the surface of that image to the fair and towards where New York is located. This idea is one that is pretty central to New York thinking (even if the rest of the world doesn’t always agree with it). 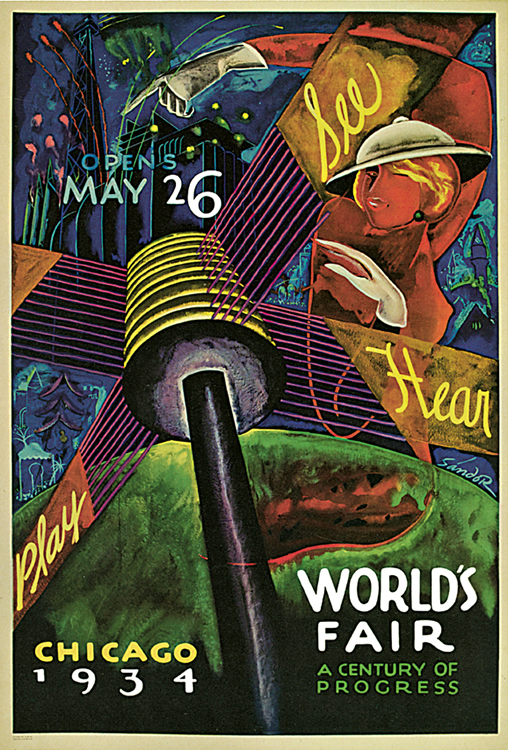 I like both of these posters, even though neither tells you what’s actually at a world’s fair. They’re colorful and eye-catching and both carry a lot of the flavor of the place where the attraction is located, which is a big plus for travel ads. This is another ad where location matters. I can’t actually tell you where this billboard was, but I could make a good guess. The website on the billboard is no longer active (or wasn’t when I checked anyway) and I know this billboard dates back to at least 2006, so it’s highly unlikely that it’s still there. Still, it’s worth pointing out as a great example of a local ad. Another way to enjoy Minnesota is to move to Wisconsin. This is one of those ads that I’m guessing isn’t funny, and might not even make that much sense, if you haven’t lived in Wisconsin (or possibly Minnesota). But as someone who has lived there, I promise, it’s funny. It’s the kind of funny that doesn’t work when you try to explain it, though. 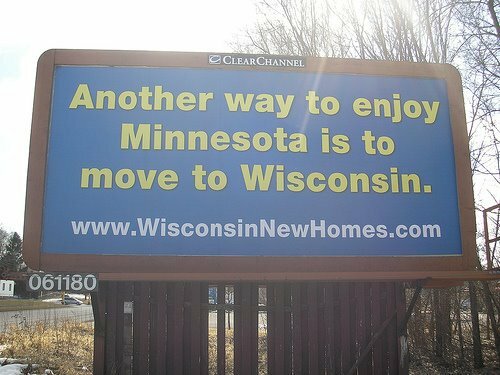 I’m not sure that this ad would really work to get a lot of people to move *to* Wisconsin, but it almost certainly worked as far as being memorable to people from Wisconsin and Minnesota and the website is pretty easy to remember. Since the company was likely as happy to sell homes to people moving from one place in Wisconsin to another, that probably was all they needed it to do. Still, local humor like this has it’s limitations. Clearly it’s got a very limited audience (depending on where this billboard stood, that may have been less of an issue for them). It can also run the risk of alienating potential customers. If people don’t understand your ads, they are more likely to think your company isn’t for them. But it has enormous potential to show locals that you’re local too and that they should trust and support you. 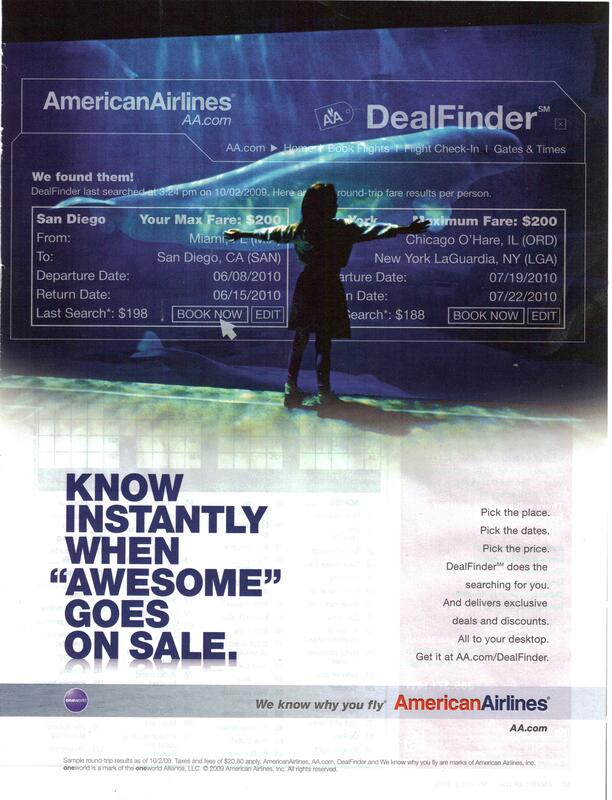 This is an ad for American Airlines that I came across in one of their in-flight magazines. I think that this ad is a little odd. The image is a picture of a kid at an aquarium overlaid with what appears to be search results from their desktop application. Since the kid has nothing to do with the desktop application, I have to assume that they’re trying to tell us that taking vacations will make our kids happy and is something a good parent does. That’s great and all, but it’s not really a message that’s related to their desktop application. The only connection I can think of is perhaps they think that parents are more likely to be more interested in finding low priced air fares than the average non-parent and more willing to download a desktop application to do so when they could just use any number of services to find such air fares that are free online and require no downloads. I have to wonder how true that is. In my experience (which is, admittedly, far from useful data, since it’s subjective and selective), since parents are often looking for good deals (especially since they have to buy more tickets than adults traveling without kids) they are more likely to shop around – check different airlines, perhaps different potential departure and arrival airports, etc. Which makes the travel websites that search many airlines and let you easily change the departure or arrival points probably match their needs better. And those services are clearly what this application is competing with. Which actually makes me wonder why it’s a downloaded application instead of a website service. I know that I think a lot more about downloading something than about using an online service that is basically a specialized search engine. This is an oddly touchy-feely ad for what is effectively a search engine you have to download. I can see why American Airlines went with this kind of advertising, but I think that perhaps they would have been better off with more of a hard-sell kind of ad that explained why this application is especially useful or powerful and should be used over a travel website that offers similar features. This is an animated commercial for JetBlue Airlines. I don’t find this commercial’s claims about how much space you get in a JetBlue seat remotely believable because I’ve never seen any airplane were a tall, lanky guy got enough space so that if he wanted to stretch his legs out straight ahead of him he would be able to without kicking the seat in front of him. Still, the seat monster from the other airline is funny and, given how much some of my taller friends dread airplanes, actually doesn’t feel that impossible. I did find myself wondering if the seat monster that kidnapped the guy in the commercial was nice enough to grab his bags along with his laptop. The ad is cute and definitely makes their point well, even if it isn’t completely believable as presented. Since the seat monster seems to be working for JetBlue, however, I have to wonder how trustworthy they really are. Would you fly with an airline that’s willing to send a seat monster to kidnap passengers from other airlines? I’m not sure I would. It’s a good thing seat monsters don’t really exist. Or maybe they do and I’m just not on their list of people to gobble up, since I usually have enough space in airline seats. This is an ad for British Airways about fashion week in Mumbai. It’s the buildings, it’s the textiles. I just think it has the most amazing pulse and this diverse sort of extreme where you’ve got haute couture happening on one side and you’ve got extreme poverty happening on the other side, and this all sort of lives in this beautiful sort of harmony. Really? That’s a “beautiful sort of harmony”? Because I’m betting that if anyone had interviewed the poor, hungry little kids who were used to illustrate the poverty part of that equation they would have said something very different about the same situation. The people who can fly from the UK to Mumbai for fashion week are not going to have to worry about extreme poverty, but that doesn’t mean that it’s ok to turn it into some cute tourist attraction for them. Those kids aren’t set dressing for the big art shows that are haute couture runway shows (because realistically, haute couture is wearable art that few people actually wear and basically no one wears as it appears in runway shows). Those kids are real, flesh and bone people who are really struggling with lives filled with not enough food or money. How do you suppose they feel knowing that there are people flying from halfway around the world to look at art most of them will never buy and even fewer will ever wear just meters from where they stand starving? And how do you think it feels to be treated as “cultural background” shots to make the city look more exotic to foreign travelers who will probably never give them a second thought? Seriously British Airways, this is pretty callous. I’m not saying that you need to drop everything and become a charitable institution that feeds and clothes the world’s population, but is it really so much to ask that you not exploit them? Those are people, not trees or buildings or cultural landmarks. People. They deserve to be treated with respect, even when they don’t have any money. And if you, as a company, don’t treat people with respect (in your ads or elsewhere), I, as a consumer, have little reason to respect you and, thus, no reason to use your service or product.. The impression your ads give is important. Why is that such a difficult concept for so many companies to grasp? Have you ever wanted to be an airline flight attendant? 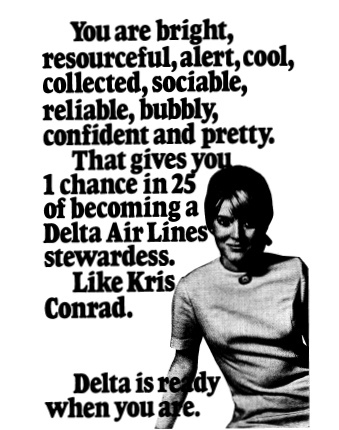 Well, in 1970 Delta went advertising for stewardesses with this magazine ad. Sounds like a personal ad for a cute co-ed, doesn’t it? And you couldn’t really list these as requirements today, even if you were looking for them. Still, it’s a great window into what Delta expected their stewardesses to be back in 1970, isn’t it? I wonder where the “1 in 25” figure comes from? This is a poster (and floor mat) that was put up behind a bench in public transport stations around Toronto to advertise skiing in Alberta, Canada. I love this ad. I think is incredibly creative and evocative. 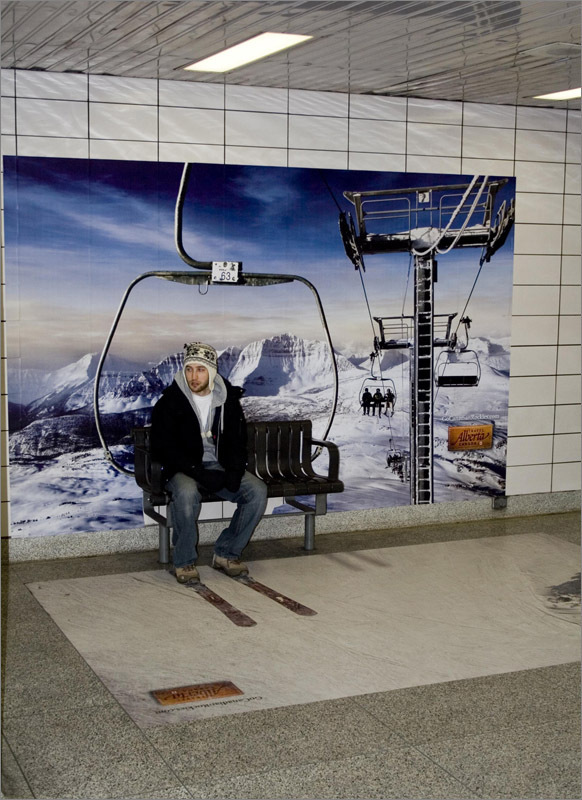 It encourages the person who sits down at the bench to sit in the specific place where the skis are, physically engaging them in the ad and making the image more dynamic for other viewers. For people who have been and enjoyed skiing, it may bring up thoughts like “wow, I wish I really was on a ski lift instead of on my way to work” while it might make those who have never had the experience wonder what it feels like to be lifted up a mountain on a bench. Either way, it gets the idea into people’s heads and makes them think about going skiing, which might increase the chances that they will book a trip to do so in the near future. I wish I saw more brilliant ads like this that actually lift the viewer momentarily out of reality, ads that actually let the viewer interact and participate. This is exactly the kind of thing I wish advertising people came up with more often! Imagine how effective this idea could be for a movie or a videogame or a book! There are so many possibilities! 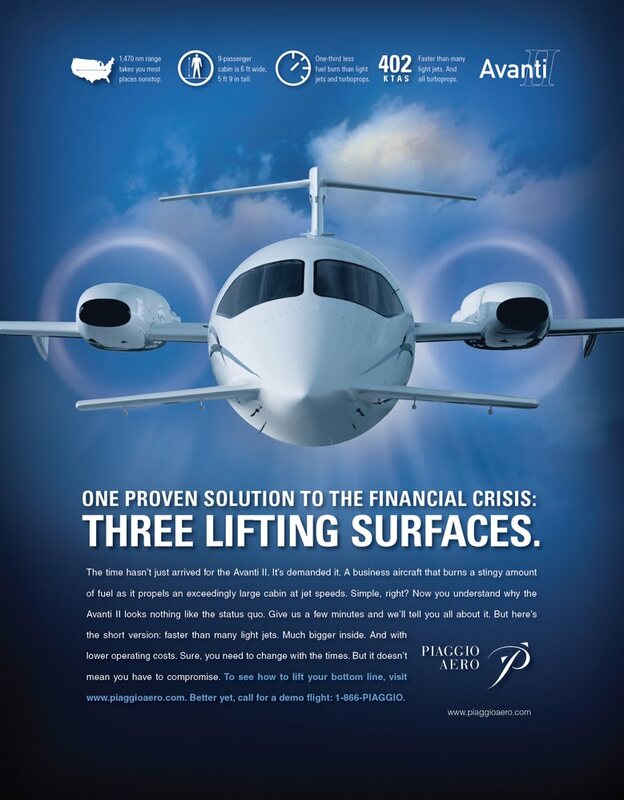 This is an ad for a Piaggio Aaro jet. It’s aimed at businesses that own corporate jets. It’s a pretty ad, I’ll give them that. The problem is that it’s kind of misleading. I look at that and I see a big, shiny airplane. The graphics at the top suggest that it’s plenty big enough to go anywhere and for anyone to be comfortable, right? Yeah, until you read the text. See that little map that shows arrows pointing from one coast to the other suggesting the plane can cross the country in one jump? Next to it the text clarifies that the plane’s range is only 1,470 nm. I’m going to assume “nm” means nautical miles (it usually means nanometers), which means that the plane’s range is only a little over 1,690 miles. The country is about 2600 miles across from San Francisco to New York. I don’t think you’ll make it across the country in one jump in this plane, unless Piaggio Aero measures distance far differently than I do. But if you have to stop in your trip from L.A. to New York, at least you’ll be in a comfy cabin, right? We can see the little graphic showing the stick person comfortably able to stand up and move around in the cabin-box right there at the top of the page! Well, that image tells us that the cabin (which holds nine people) is six feet wide and five feet and nine inches tall. As long as the seats are comfy the six feet isn’t likely a big problem, but the average height of a man in the U.S. is five feet and ten inches. White men, who are the people who predominately get to fly around in private corporate jets, tend to be taller still. At least all of this information is on the ad, though. And not even in print that tiny. Still, the graphics don’t seem to match. If I were in the market to buy a jet, I’m not sure that this ad would work on me. Besides, when you’re able to buy your own plane, your company couldn’t be in that much financial trouble, could it? So is saving money really going to be the biggest concern for them? Maybe it is. I’ve never been in that position. But I do know I wouldn’t want to feel like I was cutting corners, even a little, on something that’s going to be holding me 30,000 feet up in the air. Would you?